The life of the obsessive music geek is little better than the lot of the most desperate recidivist heroin junkie; what's worse, the addict has no methadone, no way to escape the disease discophilia: there's no cure. What normal people see as record stores, bins of LPs, or iTunes, are, to the addict, the source of untold riches and secret delights--dealers, basically--and no amount of willpower can pry the addict away from new doses, no single recording can slake the thirst for long. I went down this forking path long go, when, as a depressive and misanthropic teen, I discovered that the best way to illuminate the dismal vale of tears that is adolescence is to find records that shake off the grouchy. Many, many hundreds of small, glittering musical epiphanies later, I am no further along in the Sisyphean task which I set for myself at the age of seventeen: to find, and acquire, and enjoy every single Good Record and Good Song by Every Artist, Ever. But the good news is that I can sit down and play only excellent songs for days, if not weeks, on end, in the process turning bad days into better days and good days into great ones. The bad news is that discophilia has left me weary and broken; for every glorious fix, there is a botched reissue, an unfindable lost treasure, a pernicious record company, a brilliant band that breaks up, an geometrically-expanding list of new music to check out, and, perhaps most importantly, a bank account that says, simply, no more! In the context of such difficulties, I am happy to report that some discoveries make all the trouble and toil worthwhile, if only for those fleeting moments when to be a human being, alive and alert, is a pretty damn good thing. 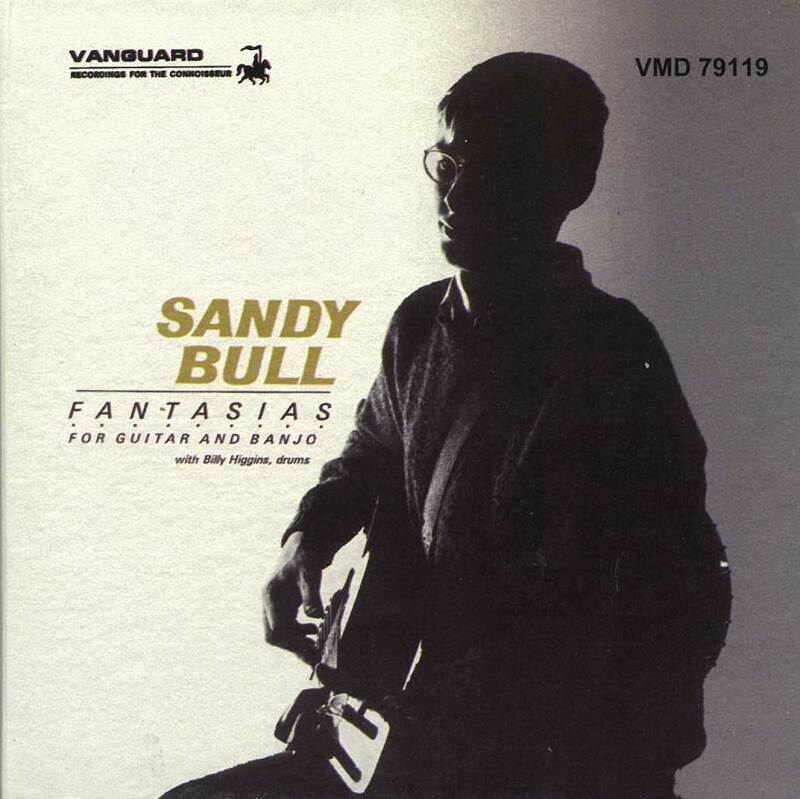 Exhibit A: Fantasias for Guitar and Banjo by Sandy Bull. Recorded in 1963, this sparkling gem of a record is the sort of album whose exquisite beauty and invention is so remarkable that you wonder how Sandy Bull is not a household name or the honoree of at least, I dunno, a commemorative postage stamp. I've been spending a lot of time lately trying to calm mental static with acoustic instrumental folk music. More placid and contemplative and airy than jazz, this sort of music--mostly from the 60s and 70s--is in my opinion one of the better ways to wrangle with your thoughts and rearrange your disputations. The most famous artisan in this genre is its ostensible inventor, the sainted John Fahey, whom I will discuss in another post. Fahey led me to Robbie Basho, and to Peter Walker, and Peter Walker led me to Sandy Bull, and now I am leading you to Sandy Bull. Using acoustic guitar, banjo, and electric guitar, often unaccompanied but sometimes with percussion (by Ornette Coleman’s drummer, Billy Higgins), Bull combines folk tunes, jazz, classical, Arabic, and Indian classical music, blurring styles and song structures; this is music beyond genre. The first side of the record is an astonishing 22-minute excursion which is more or less a raga, but with American jazz colors, and appropriately entitled "Blend"; I cannot think of other folk artists recording side-long instrumentals in 1963. Bull's prescience and creativity are even wilder, if possible, on side two, where he translates the usually-shlocky (to me, anyway) Carmina Burana into a eerie backwoods banjo hoedown. Other tracks are folk adaptations of classical and gospel music. Bull recorded a few more albums in the 60s and 70s (the second of which, 1964's Inventions for Guitar and Banjo, is a worthy successor to this one) before succumbing to drug problems. But Sandy Bull's music, a brilliant exercise in the combination of guitar and imagination, is an example of why I continue to devote my time to the search. Cover Your Tracks: Electrelane, "I'm On Fire"